Safe,Non-toxic,Odorless,Noiseless,Radiationless: Googuard electronic mosquito killer lamp uses physics formula to eliminate mosquitos,low power LED light attract mosquitoes and small flying gnats and kill them immediately by the power grids.It\'s Energy saving,environmental friendly,safe for humans and pets. 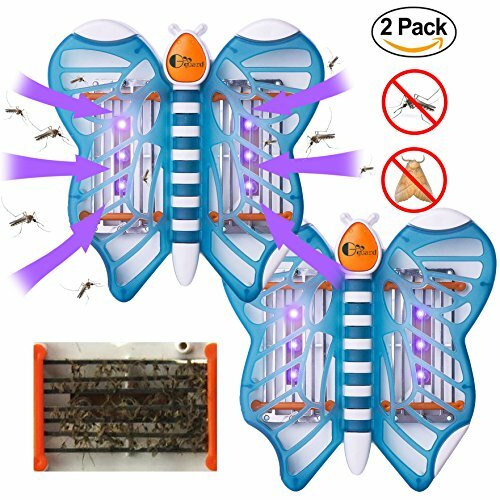 Beautiful and Practicable: Mosquito killer lamp looks like a beautiful blue butterfly,which will not disturb your harmony room atmosphere.Emitting purple light at night to attract mosquitoes and kill them without noise and harmful smell,this also can help you make clear directions in darkness when you wake up at night. Easy to Use: Just directly plug this lamp into the socket,turn it on/off.Get rid of mosquitoes fast without sticky,messy poisons or sprays.Great for places where pesticides can\'t be sprayed like kitchens and hospitals. Portable: Small size and light weight.The mosquito killer lamp measures just 5 inches long,5 inches wide,2.5 inches high and 0.12KG weight.It is very easy to carry for travel. 100% Satisfaction Guranteed: If you are not satisfied with our products,we will guarantee to provide you with a replacement or a full refund.